New Australian drama Newton’s Law premieres on ABC in early February. The eight-part series, described by ABC as the Upstairs, Downstairs of legal dramas, features Claudia Karvan, Toby Schmitz, Brett Tucker, Georgina Naidu, Sean Keenan, Miranda Tapsell, Andrew McFarlane and Jane Hall. It contrasts the lucrative barristers’ caseload upstairs and the often haphazard legal tangles in the solicitor’s office ten storeys below. Newton’s Law is further spiced with the ongoing frisson between Josephine and Lewis Hughes, the seductive man she knows she should never ever fall for. 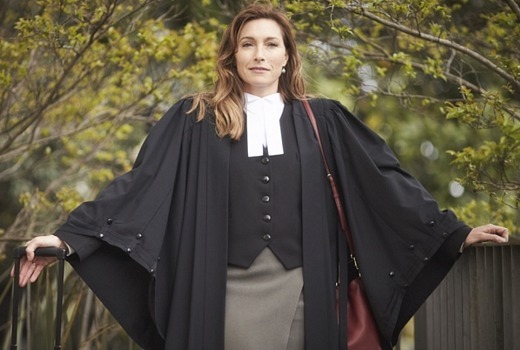 After more than a decade of battling to help the less fortunate, Josephine Newton’s (Claudia Karvan) suburban solicitor’s practice is burnt down by a disgruntled, pyromaniac client after Josephine is forced to brief an incompetent barrister to defend his case. With an impressive but brief career at the Bar, Josephine’s frustration at taking a back seat to her client’s defence is the last straw. The fact that Lewis Hughes (Toby Schmitz), Counsel for the prosecution, witnesses her torment with his usual ‘I-told-you-so’ air of amusement makes it so much worse. From the day they met under the colonnades of the Law School until the day Josephine’s waters broke and she abandoned the Bar for a colicky baby and a globe-trotting spouse, Lewis relished his role as the ‘agent provocateur’ in her life, and now he’s at it again. He’s convinced that she’s wasting her intellectual re-power, her original arguments, her sharp insights and inspired reasoning as a ‘mere’ solicitor – and after seeing it literally go down in flames, Josephine can’t help but agree. Her husband, Callum (Brett Tucker), has failed to deliver on his promise to stop disappearing to far ung corners of the Earth in pursuit of his various causes so she can have her turn at a career, and they’re in the throes of separation. Her daughter, Lydia (Ella Newton), is fifteen years old and blames her mother for everything. Josephine can’t see how her domestic life can get much worse – so what does she have to lose by going back to the Bar? Unfortunately, Josephine finds it’s not so easy to leave her entourage behind. Her clutch of ex-clients turned employees are reliant on her – emotionally and financially – despite their best efforts to survive without her – and Josephine’s best efforts to focus on herself for a change. When she discovers a former car wash in the basement is up for lease, the serendipity seems too perfect to ignore. Newton’s Legal is reincarnated as Chatterjee & Chatterjee Solicitors, Josephine’s former paralegal is reluctantly elevated to solicitor in charge and she is free to pursue her new life upstairs – with her old life only a lift-ride away. 8:30pm Thursday February 9 on ABC. I wish they chose a different title. Can’t help but see it as a new “Carson’s Law”. The show about a large cast of people living above a police station? Can’t see much of a connection. I think I would’ve rather seen more Time of Our Lives than this, but I’ll still watch it! Just what we need! Yet another ABC legal drama. As opposed to the 30 something, female making her way in the world or family sea-change. Claudia is great and am looking forward to this. I am finding the title a bit hackneyed though. I’ll leave that show for the women! Just checked out the trailer. Looks ok. Will give it a go and see how it is.